The future of sports is interactive. You’ll be able to join fans in the chat section, or offer real-time feedback on every play. Fantasy games will get bigger, as broadcasters of different sports try to copy features like the March Madness bracket. Traditional leagues will learn by watching esports, as gamers gain recognition as a new breed of professional athlete. The most popular videogamer teamed up with other streamers to offer his take on a football game. You might be able to jump into the virtual booth. Or, in the age of analytics, you want to know is how fast your guy is running, or to be afraid of an opposing player rising up for the last-second shot. Being a sports fan used to mean plopping down on the couch—or, if you were lucky, in the stands—and watching a game. That’s not really how it works anymore. More people than ever care about sports, but they’re watching less TV and fewer games. Who has time for all the commercial breaks, blowouts and between-play nonsense? Instead, we’re checking reactions on Twitter , hunting for highlights on Instagram and sending OMG-that-shot faces on Snapchat. Sports fans aren’t yet living the digital dream, though. For one thing, it’s too hard to find games online. Because lucrative live rights have mostly stayed with traditional TV networks, the only way to catch all your games is to pay handsomely for a deluxe cable subscription. Or... find a sneakier way. More than 460,000 people belong to a Reddit group devoted to streaming National Basketball Association games (without a license), and the BBC found that more than a third of Premier League soccer fans regularly watched “unofficial” game streams. As more leagues and sports take to streaming, it’ll get easier to find stuff to watch. But for sports fans, that’s only the beginning. The days of staring at the screen for three hours are about to be replaced by something more accessible, interactive and personalized. It’s—wait for it—a game-changer. On a recent Thursday night, I sat down to watch the Milwaukee Bucks play the Indiana Pacers in a late-season NBA game with serious playoff implications. My view was from courtside, so close to the action I felt as if I could reach out and touch the players as they warmed up. I couldn’t, of course: I was sitting at my desk, wearing an Oculus Go virtual-reality headset. You aren’t likely to switch to virtual reality as your primary game-viewing experience until faster internet and better headsets arrive. If you do have a headset, though, it’s worth a try—if nothing else, to remind you that those guys really are huge. A similar technology, Intel ’s True View, uses dozens of cameras to capture a 3-D view of everything on the field. You still watch on your TV or laptop, but now you can see the game from previously impossible perspectives. Want to see the game-winning shot through the eyes of the person who took it, or what the QB saw right before he released the ball? You can. See it now: True View tech is already being integrated into TV broadcasts, especially for National Football League and Premier League teams. If you have a VR headset, you can get TNT’s VR app for NBA games. This year, the March Madness Live VR app will broadcast 21 NCAA tournament games. The NCAA basketball tournament can be whiplash-inducing. In the first weekends, many games are on at the same time, with no way to know which one will have the buzzer beater everyone talks about all year. CBS Sports and Turner, which broadcast the tournament, are among many companies working on a better way. Its Fast Break is a live, best-of broadcast for the tournament’s first weekend. Rather than watching one game, you watch all of the games’ best moments, seconds after they happen. CBS and others are working on ways to do this for other sports, too, and even to personalize it so your channel could feature only your favorite players and fantasy teams. When you tune into a game, you might get the chance to choose who you want calling it for you—the standard crew, the total homer crew that’s rooting as hard as you are, or maybe the movie-star crew. In December, Tyler Blevins—better known as Ninja, the most popular videogamer on Twitch—teamed up with other streamers to offer his own take on a Thursday Night Football game. Eventually, you might be able to jump into the virtual booth yourself. See it now: You can frequently choose among multiple broadcast teams in the ESPN app. The future of sports is, of course, interactive. You’ll be able to join a teeming mass of soccer fans in the chat section on Twitch, or offer real-time feedback on every play and moment. Fantasy games will get even bigger, as broadcasters of different sports try to copy features like the March Madness bracket. Traditional leagues will learn a lot on this front by watching esports, as gamers continue to gain recognition as a new breed of professional athlete. “Our players jump in the chat, and they’ll engage with fans,” said Brendan Donohue, general manager of the 2K League, the NBA’s esports offering. It’s not crazy to imagine one day watching an actual basketball game, chatting with other viewers, when suddenly one of the bench players logs on and joins in. 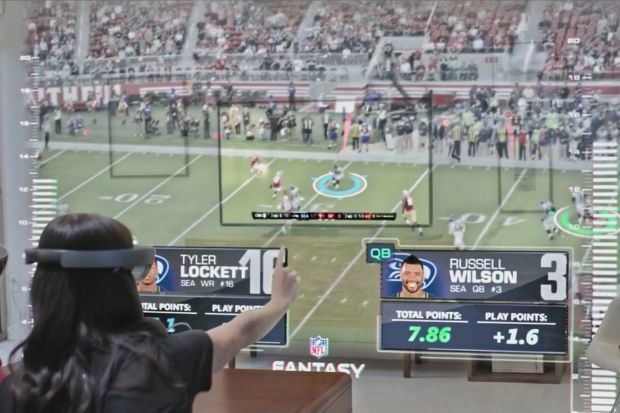 Once the hiccups are gone, it’s time to get to the true immersive, interactive future of sports. My jump shot isn’t much and my knee pops when I run, but I can still be part of the game.